The Information Technology Agreement (ITA), a trade agreement that eliminates tariffs on hundreds of information and communications technology (ICT) products, has been one of the most successful trade agreements in the World Trade Organization’s (WTO) history. As ITA accession commits countries to tariff elimination, it decreases the cost of these innovation- and productivity-enhancing ICT capital goods, which spurs their adoption and consumption among businesses and consumers alike. As ICTs have become the modern global economy’s most powerful drivers of economic growth, ITA accession can play an important role in fostering economic growth across developing nations, in part by integrating them into global value chains for the production of ICT goods and services. 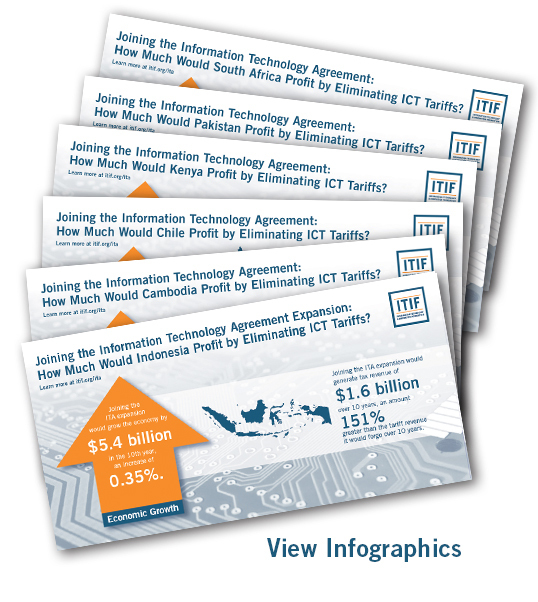 This report assesses the anticipated economic impact of Indonesia and Vietnam joining the recently completed expansion of the Information Technology Agreement and of Laos and Sri Lanka joining the ITA in full. In December 1996, 29 WTO member nations launched the ITA, a novel trade agreement in which participating nations completely removed tariffs on eight categories of information and communications technology products (such as semiconductors, semiconductor manufacturing equipment, computers, and telecommunications equipment). In 2012, owing to the tremendous success of the ITA, member nations started negotiations toward expanding the ITA to add innovative ICT products commercialized since 1996 as well as some categories of ICTs not included in the original agreement. ITA expansion negotiations concluded in December 2015, with parties agreeing to bring an additional 201 high-tech products, such as new-generation multi-component integrated circuits, touchscreens, GPS navigation equipment, and medical equipment such as pacemakers and ultrasonic scanners under ITA coverage. The expansion, which the WTO estimates will eliminate tariffs on an additional $1.3 trillion in annual global trade of ICT parts and products, an amount equivalent to approximately 10 percent of world trade in goods, represented the first major tariff-cutting deal completed at the WTO in 19 years. With product expansion of the ITA completed, attention has turned to broadening country membership in the ITA, including both encouraging existing ITA members to join the recent ITA expansion as well as attracting countries that are not yet ITA members to accede to both the original ITA and the expansion. Developing economies have benefitted tremendously from the ITA. In fact, developing economies’ share of world exports of ITA products more than doubled over the past 20 years, increasing from 26 percent in 1996 to 63 percent in 2015. This is higher than their share of world total exports, which grew from 27 percent to 43 percent over the same period. ITIF finds that Indonesia and Vietnam would benefit significantly from joining the ITA expansion (both countries are members of the original ITA) while Laos and Sri Lanka would benefit from full ITA accession. All four countries’ economies would grow as a result of full ITA participation, with estimated growth forecasted higher for Laos and Sri Lanka because they would be joining the ITA in full while Indonesia and Vietnam would only be joining the ITA expansion. After ten years, the Laotian economy would grow nearly 2 percent larger, and Sri Lanka’s 1 percent larger, than would otherwise be the case as a result of ITA accession. In the tenth year post-ITA accession, Indonesia would more than fully recover tariff losses resulting from ITA accession. Sri Lanka would recover 47 percent of tariffs forgone, Vietnam 38 percent, and Laos 24 percent. Laos recovers the lowest percentage as its effective realized average tariff rates on ITA imports currently exceed 8 percent. However, governments should recognize that the short-term costs in terms of tariff revenue forgone are much exceeded by the longer-term economic growth ITA accession can engender by bolstering a country’s ICT capital stock, thus unleashing greater levels of productivity and innovation across all sectors of their economies. Countries should view tariff revenue forgone as an investment in their ICT economy just as much as broadband deployment would be, and further recognize that tariff revenues “forgone” really aren’t; in fact, those “revenues” flow through directly to a country’s citizens and businesses, who can now purchase ICT goods at lower cost. This report proceeds by briefly summarizing how ICTs drive developing country economic growth, describing how ITA accession can benefit developing countries, and explaining the methodology behind the report’s economic analysis. It then provides an overview of the ICT economy and an analysis of full ITA accession for each of the four study countries. This report builds on a prior report, “How Joining the Information Technology Agreement Spurs Growth in Developing Nations” issued in May 2017, which assessed the impact of ITA accession on six other developing countries: Argentina, Cambodia, Chile, Kenya, Pakistan, and South Africa.